Running a Kickstarter is effectively a full-time commitment, and when it became clear we were unlikely to hit the goal, I cancelled the campaign to refocus attention on what the next steps should be. The Kickstarter campaign had a funding goal of £45,000 which would have let me focus full-time on development as well as be able to commission music and artwork to get the game up to a more polished alpha release. As this goal wasn’t met, the only real alternative is to continue working on the game in my spare time (outside of working a full time job to pay the bills) and I felt the next best step was to launch a new crowdfunding campaign with a much lower goal, this time only needing to pay for art and sound contributions. Of course it was disappointing to not make the Kickstarter target at the time, but it was wonderful to see all the support come from hundreds of backers, as well as an extremely positive reception demonstrating the game at EGX Rezzed. I was frankly blown away by how much people were enjoying the very early prototype build, which to me was little more than a tech demo with a few minutes of barely-playable content to tinker with. 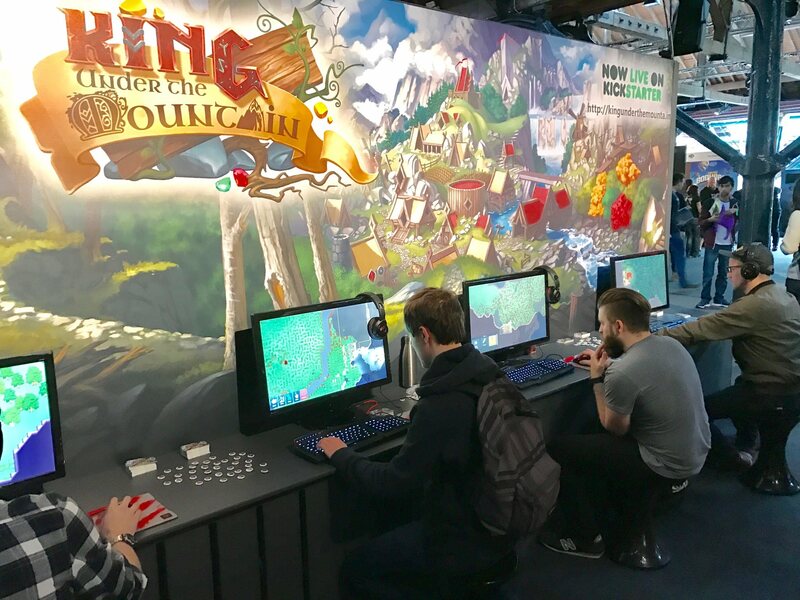 If you managed to drop by the Rezzed stand, thank you so much and I hope you managed to bag one of the King under the Mountain badges we had on hand before they were all snapped up. Also massive thanks go to Jordan Chin, our composer, who flew over from the USA to attend the exhibition, as well as Mike and Joe (close friends of mine, who are also developers, that I’d love to bring onboard if the game is successful enough to be able to afford it) as well as my wife Kirsty, who also managed many hours on the exhibit floor despite being several months pregnant by that point. I put out notifications that the Kickstarter was cancelled, due to return “soon” with a reduced funding goal for the reasons stated above. After a lot of deliberating about it, I realised that with moving house in June and a baby due in August, both super-disruptive, I wouldn’t really have any spare time to dedicate to a project. If the Kickstarter had made its goal it would have been fine because the day job would have been replaced with developing King under the Mountain, but without this goal I have to keep the day job, not really leaving any time for a “hobby” project. I couldn’t in good conscience take people’s money from a second Kickstarter campaign, only to immediately put the project on ice for a few months, so in the end I decided to put everything on hold while I got back to a stable work/life balance and defer running a new Kickstarter campaign to some point in the future. It’s now several months later and I’m thrilled to say I’m getting to that place – I’ve been able to put more time into game dev and I’m going to be ramping up the speed of development again. As well as a general code cleanup (after a lot of scratching my head over what was I thinking looking at “old” code) the first small update lets players build over existing items – in the prototype you had to wait until an area was clear before you could build there. Now I’m working on getting the river implemented into the game world – this is the precursor to growing crops as well as being a water source to drink from, leading into the basic needs of the settlers (food, drink and sleep). The first step is developing a semi-realistic water flow algorithm to model how and where the river flows to. So now that development is kicking off again, it’s time to look to the future. The medium-term goal is to complete everything in the “Alpha 1” section of the roadmap to then start selling the game followed by monthly or bi-monthly releases into the rest of the roadmap. Initially this would be on sites like Itch.io and Humble Bundle, eventually progressing to Steam when the game is complete enough. On that note, we successfully passed through Steam Greenlight (while it was still running) opening up the route to releasing on Steam, or really just avoiding the Steam Direct fee, but at least it’s nice to see there’s demand from the Steam audience (and thank you very much if you voted there!). However, there’s a lot of work to be done between Alpha 1 and where the game is now. While moving house and having a baby are very expensive personal events, there have been many other circumstances beyond my control which have resulted in the fact I’m not able to fund development of King under the Mountain in the manner I’ve been lucky enough to do so far. While I plan to continue to work on the game as much as I’m able, as a terrible artist I feel I at least need to commission artwork to get the game to that state. I firmly believe artists deserve to be paid fairly for their time – as a programmer I generally wouldn’t be willing to work on a future revenue-share basis, everyone has bills they have to pay today rather than potential future earnings (which might not happen). So if you’d like to help accelerate the game’s development, please consider pledging towards the Patreon (even $1 a month makes a difference!). The Patreon will effectively contribute a pledge amount (of at least the same value) to the next crowdfunding campaign (likely Fig or Kickstarter) which will have a pledge manager (such as BackerKit) to organise pledges and add-on rewards including a credit for any Patreon contributions. As an example, if you were to contribute $3 a month from now until the Kickstarter run in (for example) 10 months time, you’ll receive a $30 credit on the pledge manager even if you don’t back the crowdfunding campaign. I’m not expecting people to back the game on both Patreon and a crowdfunding campaign, so I think this approach gives the best of both worlds and lets people go with the option they’re most comfortable with. Sorry for the wall of text this month. I always try to be open and honest with the development process of King under the Mountain, so I thought it important to spend some time explaining my thoughts and plan to move forward.